Thanks to our chef friend Jamie Oliver I was inspired to try one of his excellent recipes. * Rinse and dry the turkey breast. * Turn the breast over and take a sharp knife to carefully slice into the natural join of the breast muscle and pull it back as you slice to creat a pocket. * Season well with salt and pepper and drizzle a nice amount of olive oil over entire surface. Sprinkle half of the rosemary leaves over the surface. 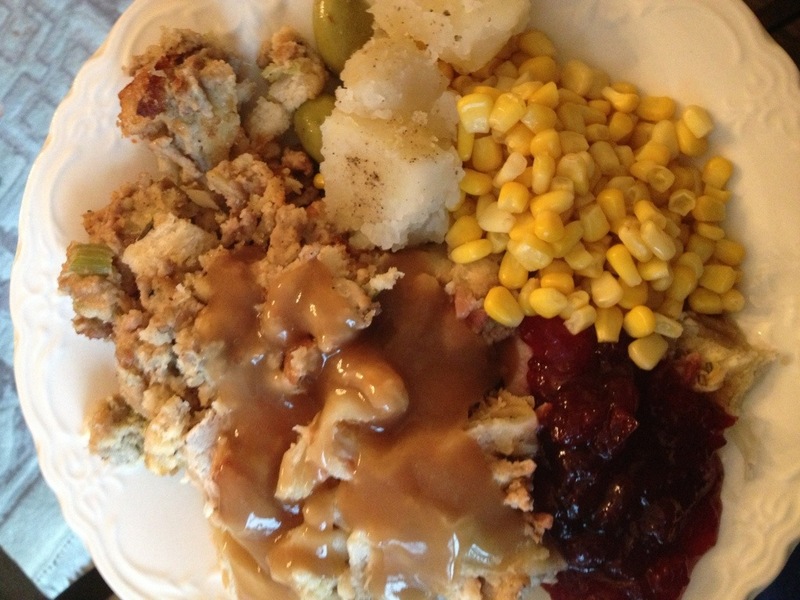 * Spread the cranberry jam into the pocket… Make sure you get into all the little areas. Now fold the flap back over and put the two halves together – “Swiss roll” style. 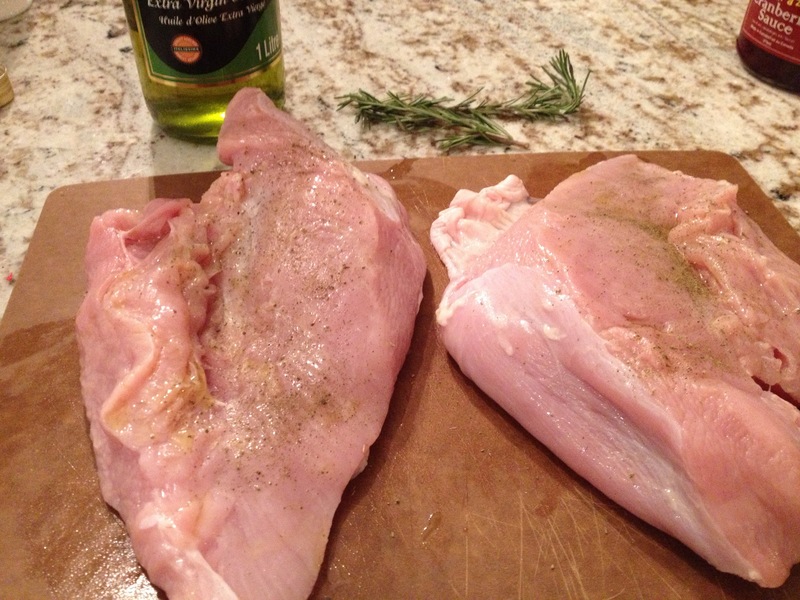 * Once the breast is right side up, olive oil the surface, and season with salt and pepper. * Top the breast with the rest of the rosemary and a little finely chopped sage. 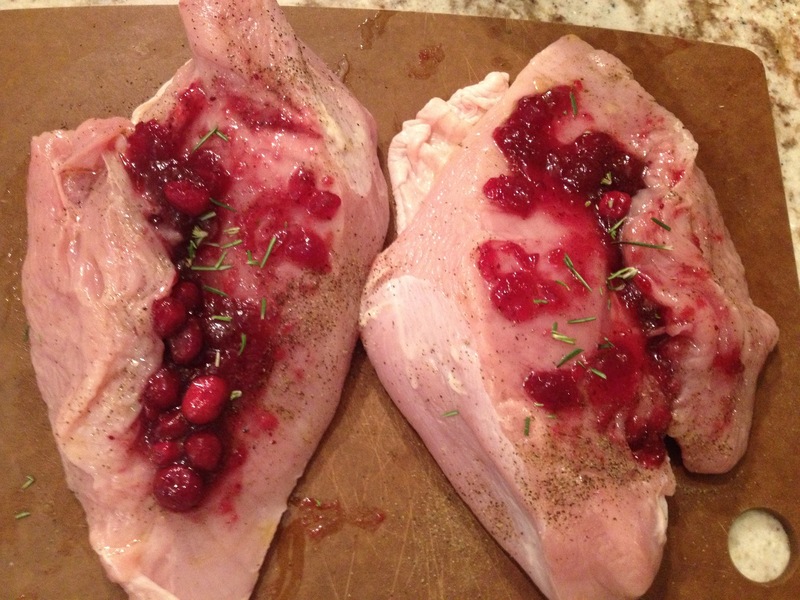 * Ensure that breast is sealed so the cranberry stays inside… Use cocktail toothpicks if needed. * Cover in tin foil and put in the oven for 60-70 mins or until just cooked through- use a meat thermometer and ensure it reads 72c at the center or thickest point . * Soak the porcini or mushrooms in hot water for approx 5 mins. * Chop the bacon into thin strips width wise and cook until the bacon caramelizes (add in 1 sprig of rosemary leaves in the last min or so of cooking) and is almost crispy. Pull the bacon from the pan and put off to the side leaving the rendered fat in the pan. * Take the mushrooms from the water and put into the bacon pan and cook for a few minutes on medium heat. Add in a spoon or two of the mushroom water and a tab of butter to the pan and keep cooking until the mushrooms start to caramelize. * Put the mushrooms directly into a food processor or blender and pulse a few times. Now add the mushroom mix to the bacon rosemary mix and let cool. 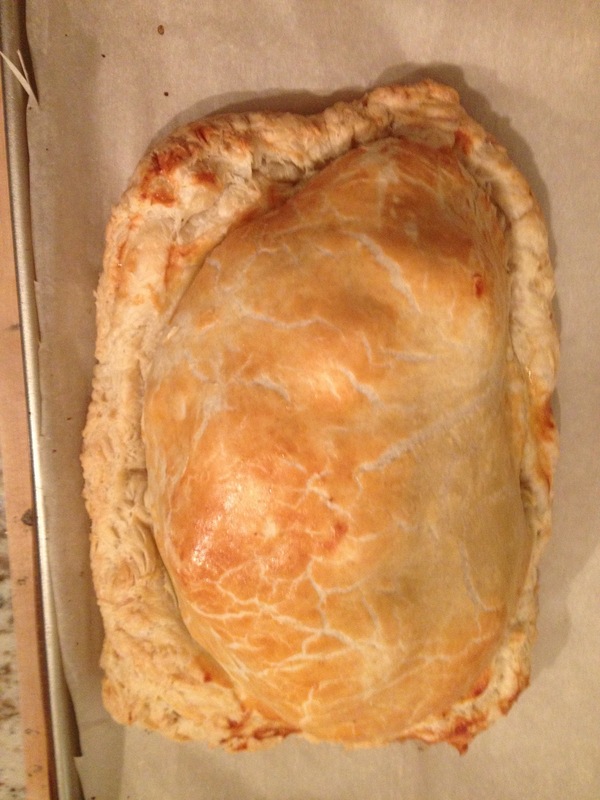 This Wellington is perfect made the night before but please be sure to let everything cool in between steps as you do not want to put the puff pastry on hot food as it will start to melt and soften the pastry which is not good. 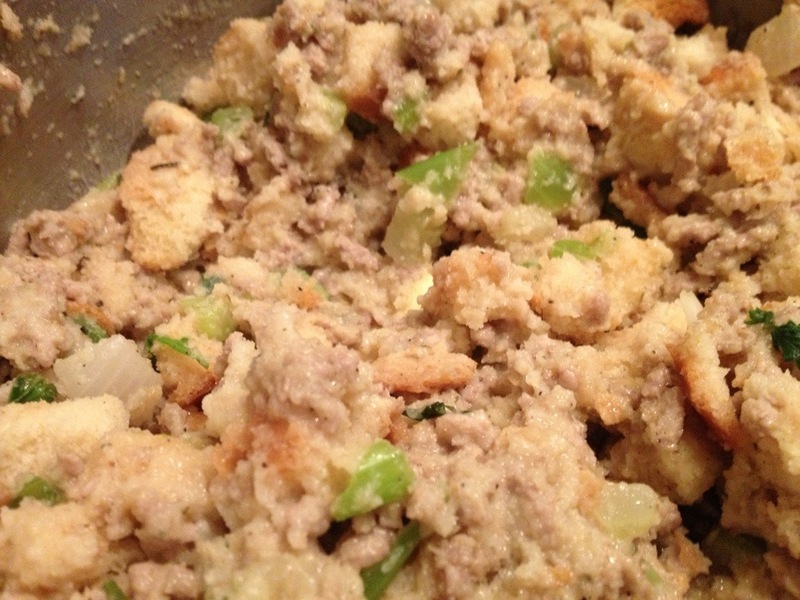 * Now coat the bottom with the bacon/mushroom mixture, and lay the cooled turkey breast on top of the mixture. Egg wash the edges of the bottom puff sheet. * Now roll out the second package of puff to slightly bigger that the first piece. 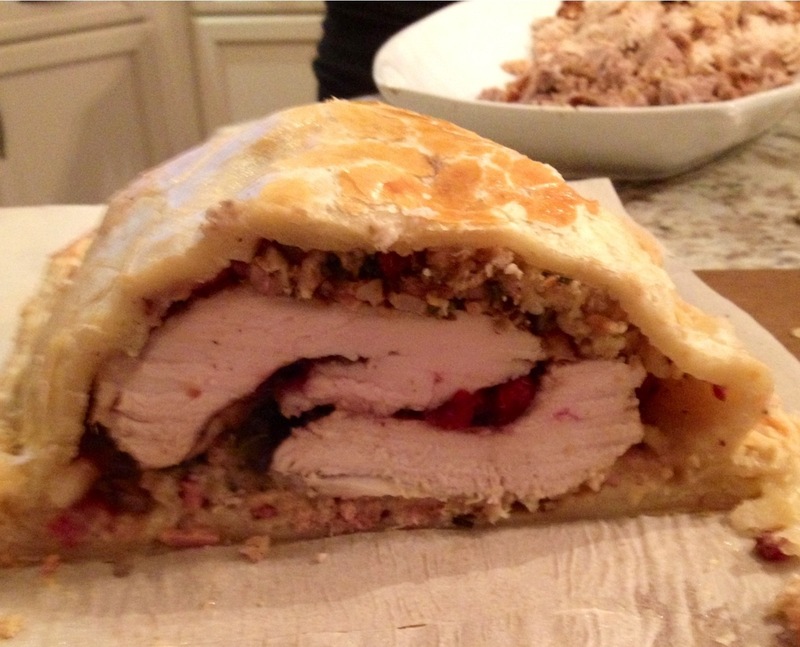 Top the turkey breast top with a stuffing layer and top that with the rest of the bacon/mushroom mixture. 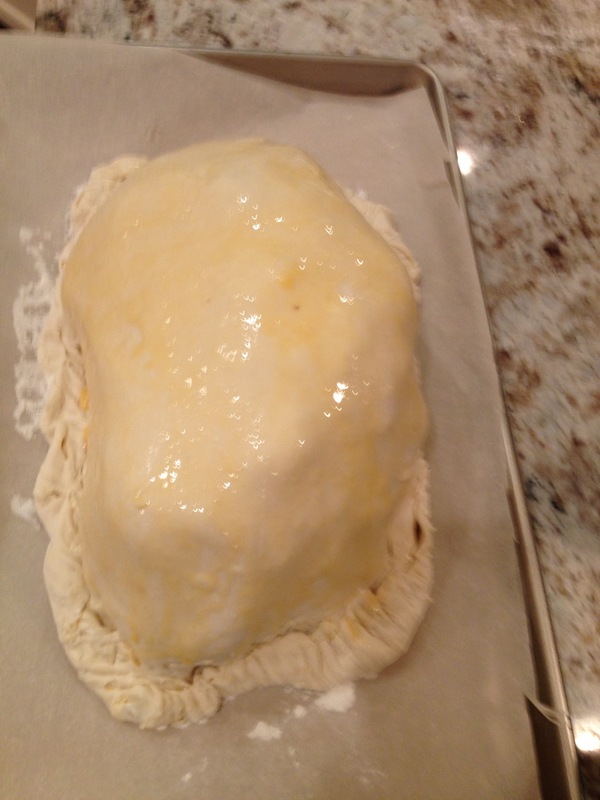 * Now it’s time to put the top piece of puff over the top and push down onto the egg wash sides to seal the box. Trim the edge of the excess pastry. * Now be the food artist you know how be (I wasn’t such an artist on this one but it didn’t affect the flavors)and basically take your index finger or thumb and fold over and press all around the edge to seal the whole box. * Egg wash only the “dome” or turkey part of the puff pastry. Put the whole piece of art into the fridge un-covered overnight. You can either build your Wellington on your roasting pan/baking sheet lined with parchment paper or carefully transfer it. On Christmas Day set the oven to 350F and place the turkey into the oven for approx 50-60 mins or until the pastry has risen and is golden brown. 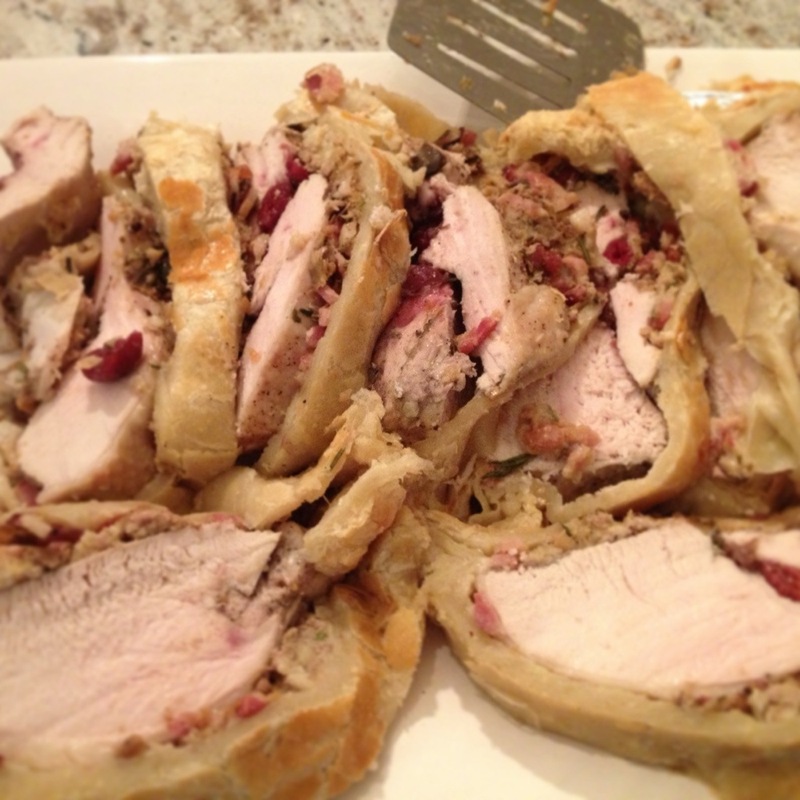 After you let the Wellington rest for a few minutes move it on to a cutting board. Cut into approx 1″ pieces and serve with gravy poured right over your perfect slice and serve with your favorite fixings. The flavors were wow and the tummies happy! Thank you Jamie Oliver- I hope you didn’t mind me making it my own with a few tweaks!